Congrats on your wonderful news Dorothy!! Especially now when so many are shattered and suffering, it’s wonderful to hear about your family togetherness! LOVE LOVE LOVE the adorable fruit hat too! Sage advice about being prepared…life has a way of blindsiding us so being prepared is so crucial! What a blessing, and an answered prayer! How wonderful! Is the move back final and official with all the approvals needed? I’m so happy for you, Dorothy. Answered prayers. And, aren’t those fiber trends hats adorable? 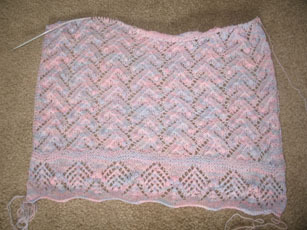 Your Madli is coming along nicely. I recently gave up on Madli because for some reason I just couldn’t get it. 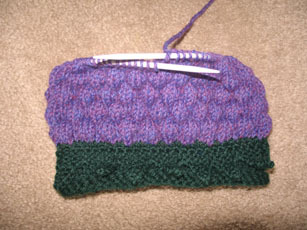 I’ve decided now that it was the yarn and I subconciously didn’t like it, so I kept messing up. I have new yarn and am about to start again. Yours is definitely inspiring! Wow, you’ve been busy, Girl! I was delighted to see your zip up the front Rogue. I made the Rogue for my daughter last year (no zip) and loved the pattern. Now I might have to make a zip version for moi. Your lace is gorgeous, too!